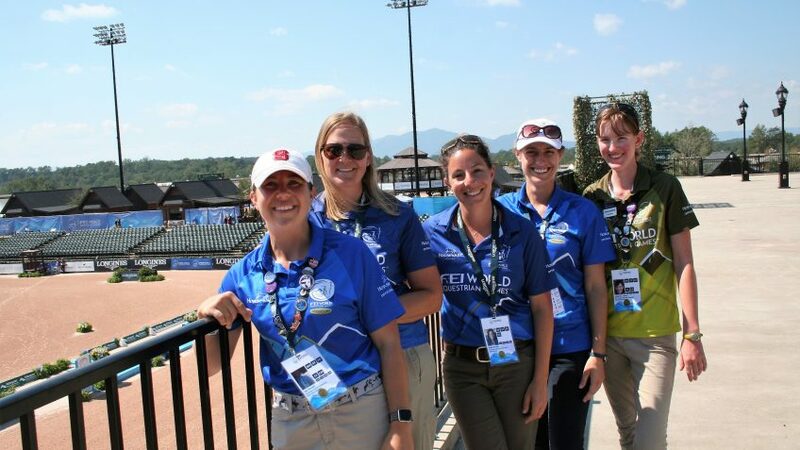 College of Veterinary Medicine volunteers near the track at the World Equestrian Games. From left to right: Zoie Randall, Myra Durham Nimet Browne, Amber Nebel and Zan Carlson. Over in the southwest corner of the state, near the North Carolina/South Carolina border, the world’s equine athletic community gathered in September for its quadrennial World Equestrian Games (WEG), as unlikely and unexpected a setting for an international competition as you could imagine. More than 500 of the 727 competing horses from 68 different countries flew into the Greenville-Spartanburg (South Carolina) International Airport on chartered planes. All made their way to the Tryon International Equestrian Center (TIEC) for their required 42-hour quarantine in preparation for the 13-day competition. Almost as soon as they were settled into stalls overlooking the Blue Ridge Mountains, Hurricane Florence rumbled right over the stables, dumping rain and creating chaos with the packed schedule of eight disciplines of equestrian events for the 723 participating athletes. Not all was perfect, nor was it expected to be. The foothills area around Tryon, home to U.S. Olympic Trials in the 1940s and ‘50s, has long been a big part of North Carolina’s $2 billion equine industry. TIEC, built on top of a bankrupt golf course and opened in 2015, is still in its infancy. It had hoped to host an event on the scale of the World Equestrian Games sometime in the future. However, less than two years ago, the original host of the 2018 games (Bromont, Quebec, Canada) withdrew because of a lack of funding. TIEC, the centerpiece of the 1,600-acre Tryon International Resort, offered to host in its place. Its bid included benefits for tourism, new infrastructure in a rural area and a display of the state’s capacity for holding another worldwide sporting event as it has for golf, auto racing, professional football and NCAA athletics. Not all went as planned. But for select NC State College of Veterinary Medicine students and faculty, it was an unprecedented opportunity to provide large-animal care and oversight at the largest sporting event to be held in the U.S. this year and one of the five largest international events. “For what we went to do, it went really well, in terms of managing the veterinary issues around the games,” says CVM Dean D. Paul Lunn. “We were there to support and be part of the Veterinary Services team. They confronted several big challenges, but our primary job was to help get these horses safely into the country and then get them out again without contracting any infectious diseases. The Tryon International Resort, official host of the games, is nestled in North Carolina’s unique Isothermal Belt, so named for the foothills-related temperature inversion that creates longer and milder growing seasons for cool weather agricultural products like apples and grapes. Mostly in Polk County — which had exactly one hotel before the WEG was awarded to the area — it’s not far from the state border, where dueling roadside fruit stands offer early-season apples and discount cigarettes on one side and late-summer peaches and discount fireworks on the other. It’s an area of gently rolling hills, like those of a kiddie roller coaster, green in the undulating fields, blue and smoky in the shadow of the Blue Ridge mountains. Not far from the tourist destination of Lake Lure, Tryon is surrounded by the old weave-and-spin foothills towns that have never fully recovered from the loss of textile manufacturing that sustained them for decades. A worldwide equestrian facility certainly offers much more economic growth capacity than the annual Dirty Dancing Festival less than 10 miles away. The WEG promised to be a godsend, with estimates of up to 500,000 spectators, $200 million in economic impact and $100 million in real estate sales. For various reasons, from unexpected weather to unfinished infrastructure, those numbers did not fully materialize. From an equine biosecurity standpoint, however, the games went well in the eyes of Lunn, who was part of the team responsible for developing guidelines that helped keep both international and domestic horses healthy, a particular challenge for one of the largest competitions of its kind, which mixes animals from all over the world, all with different backgrounds. CVM faculty Nimet Browne and Myra Durham were among the 70 veterinarians from around the world who were charged with taking care of the equine participants as veterinary services providers. It’s what they always do, caring for large animals, but with years’ worth of treatment compressed into a little less than three weeks. CVM fourth-year student Zan Carlson (left) served as a student steward during the World Equestrian Games event. That wasn’t exactly easy when Florence circled around the North Carolina coast, fluttered around South Carolina for several days, then lumbered right over the site of where the horses and riders were housed the first weekend of the event. “Honestly, that was our biggest challenge,” Browne says. “On top of having to manage a competition of this scale, then you throw a hurricane into the mix, logistically for spectators, horses, athletes, for traveling here, it was really challenging. Zoie Randall, a fourth-year vet med student from Mooresville and a former competitive rider, was selected to be a member of the American Association of Equine Practitioners student externship staff, along with fellow fourth-year CVM student Kristen Livengood. 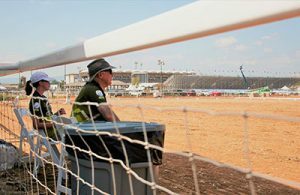 They spent much of their time at the multiple event venues, keeping an eye on the competing horses and ensuring they were handling the oppressive heat and humidity that followed the hurricane and taking care of on-site issues horses may encounter. Randall’s mother is a 1987 CVM graduate and licensed veterinarian in the Mooresville area, so she was naturally attracted to NC State’s animal science program with the hopes of one day also becoming a vet. She’s accepted an internship following graduation with a Florida equine practice, and spending three weeks at the WEG was an educationally enhancing experience. Being able to work here is something I can cross off my bucket list. Alexandra Carlson and Amber Nebel served as student stewards at both competition and practice venues and the on-site barns where horses and riders were throughout WEG. “I really had no idea what to expect when I volunteered,” Carlson says. “The best part for me is just being involved with an event of this scale. I haven’t had a lot of experience with anything like this. Nebel, a former vaulter, attended the 2010 WEG in Lexington, Kentucky, as a spectator, spurring her interest in studying veterinary medicine. And nothing could be better preparation for that part of the students’ education than an international equestrian competition, nestled deep in the western foothills of North Carolina.